Flu season is in full swing, and once again reports are coming in that formerly healthy people are suffering serious harm or even dying from taking the flu shot. The fact that the annual flu shot is deadly and dangerous is not a fact even in dispute. But these facts are seldom, if ever, communicated to the American public before marketing the flu shot to the entire population, including those most vulnerable such as young babies and sick seniors, as the flu shot is marketed in retail pharmacy stores across the nation as if they are just as safe as buying a candy bar or pack of gum. As you will see here, the Department of Justice report on compensated cases for vaccine injuries and deaths in the U.S. Vaccine Court, submitted each three months to the federal government Advisory Commission on Childhood Vaccines (ACCV) under the U.S. Department of Health and Human Services, shows that millions of dollars are being spent for injuries and deaths due to the flu shot. As far as I know, Health Impact News is the only news source publishing this government data on compensated cases due to vaccine injuries and deaths. 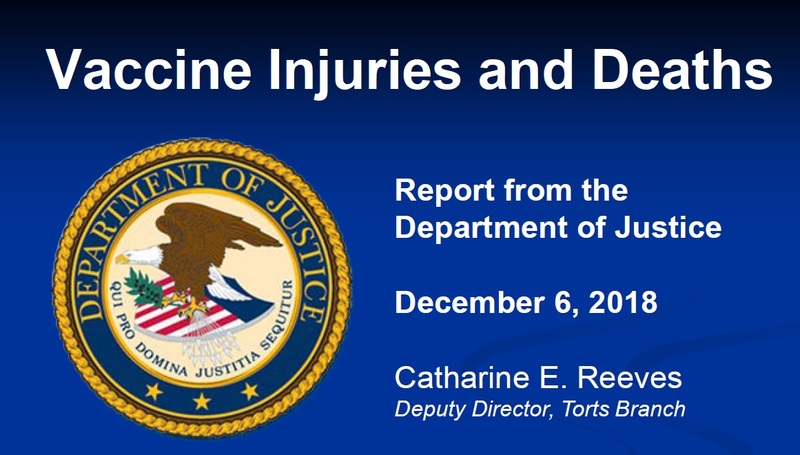 The December 6, 2018 meeting just concluded, and Government attorney Catharine Reeves reported that there were 144 settlements for vaccine injuries and deaths the past 3 months, and 89 of those cases were listed in her report. Of those 89 cases compensated, 77 were for injuries and one death caused by the flu shot, making the flu shot the most dangerous vaccine in the United States, by far. So let me get this straight, we, as Americans, must get this vaccine, in some cases, even be fired from our jobs if we refuse it, AND we the American taxpayers have to pay for it?????? This is bs! No way are "they" getting away with this!!! There’s no date on this article to reference.